Last week, both The Nevada Independent and Nevada Current reported on the demographics of state-sponsored charter schools as reported to the State Public Charter School Authority Board on November 30, 2018. There was a lot of good news. Over the last ten years, the population of students attending state funded public charter schools increased from 3,543 (in 2008) to 42,333 students in 2018, with much of the growth coming from increased enrollment of Hispanic, two or more races and Free & Reduced Lunch (FRL) students. As the State Public Charter School system has grown and matured, its student population is looking more and more like the population of the state. And charter schools are succeeding in all parts of the state, from urban schools in Clark County to rural schools in Fallon and Elko. Of the 109 5-star rated schools across the state, 26 percent are SPCSA-sponsored. 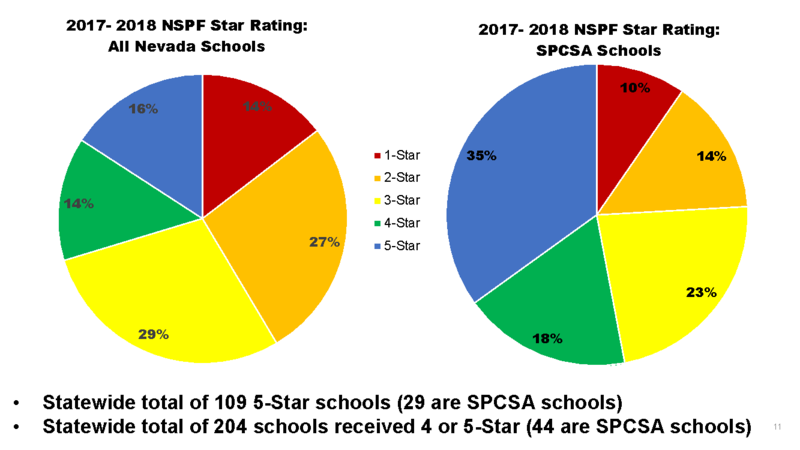 Further, while 30 percent of traditional public schools in Nevada are 4- or 5-star schools, more than 50 percent of SPCSA-sponsored public charter schools are 4- or 5-star. Moreover, nearly 75 percent of SPCSA public charter schools received a 3-star rating or higher. Meanwhile, among the lowest performing schools statewide, 14.7 percent were given a 1-star rating, but only only 9.6 percent of SPCSA schools received a 1-star rating (notably, five of the eight charter schools rated only 1-star are virtual schools, which will be the topic of a future op-ed). In summary, state-sponsored charter schools are providing high quality seats for a majority-minority student population across the State of Nevada. In a state that consistently ranks among the worst for education outcomes in the nation, the accomplishments of state-sponsored charter schools should be applauded, examined, and replicated among all public schools. Indeed, if the goal of the Nevada Department of Education is to make Nevada the fastest improving state in education in the United States, it should be noted by policymakers that state-sponsored charter schools are leading the way to that improvement. The foregoing successes of students at state public charter schools extends across nine of 10 demographic categories. Very simply, students of every kind who attended charter schools outperform their peers in other public schools. As the Chair of the State Public Charter School Authority, I am proud of these numbers. I have also paid close attention to a criticism often levied against state-sponsored public charter schools: that we aren’t serving as many poor students — generally known among education professionals as Free & Reduced Lunch or “FRL” students — as other public schools do. Moreover, the criticism goes, of the FRL students who are attending charter schools, the results achieved are worse than other state public schools. Given a plain reading of the numbers, this criticism is fair — and one to which I am especially sensitive because I have a personal and intimate understanding of what it means to be an “FRL” student. As the oldest of five children of a single mother who worked two and sometimes three jobs in order to pay rent and put food on the table, my brothers and sisters and I relied on the free breakfasts and free lunches at the public schools we attended (not all schools provided breakfast, but when they did, my family participated in the program). While we were grateful to have the meals provided, I can’t tell you how embarrassing it was to be “one of those students.” We were teased by our peers and patronized by many adults. Nevertheless, as I recall that part of my life, the thing that resonates with me most as I examine school performance is this: FRL students are far more than children in need of a free meal. Our story, and the stories of families in the neighborhoods we lived in, are difficult and complex. As I write this, it is a struggle to articulate what being poor – really poor – is like to readers who have not had that experience. We are an often misunderstood minority. I can tell you that while school occupied most of our day, education was not our highest priority. Survival defined our existence. We did not focus on life goals, college or dream about our careers. We focused on getting through our day without being hungry, bullied, abused or mistreated. And because surviving was difficult, we were a transient family and moved often to find opportunity. Before graduating high school, I had attended 15 different schools in California, Oregon and Nevada. If at any point in my youth there had been a public charter school that could have provided a better education than the public school I was zoned for, my mother would not have known about it — or put in the time or effort to find out more about it, even if she did. It is regrettable that over the last 30 years, not much has changed for low-income families like the one I came from, except that they seem to be getting poorer and it is getting more and more difficult for them to rise out of poverty. While I can’t speak for all “FRL” students (no one really can), I think the challenges with serving them well are: (1) they have more significant life issues than just getting good grades and doing well on exams; (2) they do not have stability in their homes and tend to move often, which means they change schools often; and (3) they and their families are not aware of all the educational opportunities available. To overcome these challenges, these children and their families need outreach, intervention, and support. Unfortunately, our present-day public education system is not equipped to deal with the problems and complexities presented by low-income families. The per pupil funding mechanism for education barely funds the basics of education adequately, as it is. It does little to provide the many non-education services and supports FRL children and their families need if they are going to have any hope of academic success. Until policy makers and educators truly understand this problem and unite to address it, generation after generation of FRL students will continue to fall through the cracks. It really does not matter whether a school is a publicly funded charter school or a traditional public school because the data shows we are all failing to serve this population of students well. The hard truth — one that does not get enough focused attention from a Legislature that meets a mere 120 days every other year — is that we are not adequately addressing the non-education problems that affect our schools, our kids and their families. While the “new Nevada economy” is humming along and creating high-paying jobs for some, the evidence from all the data is that there is a large population of people who are being left behind in a hopeless cycle of poverty. Despite the systemic problems inhibiting providing effective services for FRL families, I accept the responsibility and the challenge: the SPCSA must find a way to lead the state’s efforts to successfully serve all children, regardless of their demographic classification. As Nevada’s only statewide authorizer, we have to do a better job of authorizing schools that will provide high quality education to all students. Students of every race, ethnicity and culture. Students with disabilities. Students from every socio-economic background. No excuses, just a consistent focus on results. The SPCSA is in a prime position to come up with innovative approaches to serving students and families and making excellent public schools available to all students. If done well, the authorizing work of the SPCSA can increase statewide student achievement by expanding the supply of quality public schools. There are three principles of quality authorizing that can guide our work: Autonomy, Accountability, and Access. Autonomy. It is important that we protect and respect the expertise of educators and school leaders. They will lead the way if we let them. Teachers and school leaders are the ones who are embedded in the communities and serving the children and families face to face. They know what each student needs — and are in the best position to find unconventional ways to address the complex and varied situations of the students in their care. Accountability. Our SPCSA Board is working with staff to update and revise our academic and organization performance frameworks. We are also working on ways to provide incentives and rewards to schools that serve FRL students and other underserved populations. Our frameworks will consider the students being served in each demographic category and then reward schools (with index points that tie into ratings that may tie into grant funding or borrowing ability) for providing education to underserved and at-risk populations — and also reward schools that are actually closing the achievement gap in measurable ways. If charter schools fail to meet standards, our Board will continue to hold them accountable. Our “intervention ladder” starts with a notice of concern, followed by a notice of breach, and then, if necessary, a notice of intent to terminate, followed by termination of the school’s charter. Access. 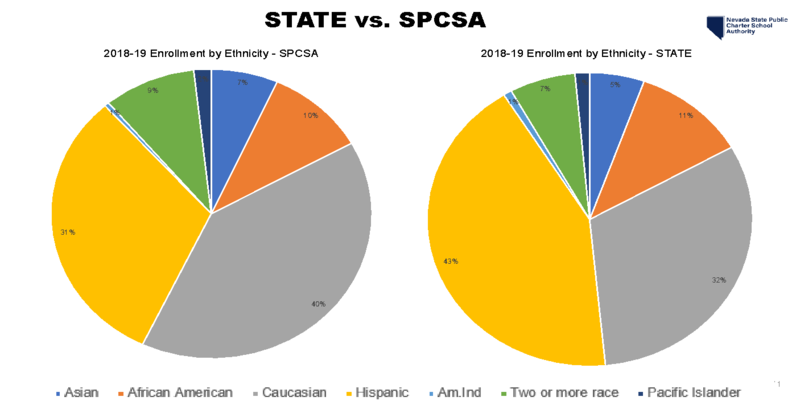 The SPCSA will continue to maintain a commitment to ensuring that state sponsored charter schools provide nondiscriminatory access to all eligible students. Further, the SPCSA will continue to make sure that each student receives fair treatment in admissions and disciplinary actions. Likewise, each state sponsored charter school will continue to be required to provide appropriate services for all students, including those with disabilities and English language learners, in accordance with applicable law. To add to this existing foundation, the SPCSA will be asking state-sponsored charter schools to engage in outreach and provide information to low-income and underserved communities regarding available charter school seats. This is important because most families in underserved communities do not know they have any other option other than the public school for which their children are zoned. There is also simply no question that we need more high-quality charter schools in high-risk and low-income communities and neighborhoods. Schools like Mater Academy Mountain Vista (4 Star – 78.5 index score which on NSPF) and Equipo Academy (95 percent graduation rate) are leading the way in our portfolio of schools. Presently, the SPCSA is working to authorize more quality charter schools like these two. Fortunately, there are a number of charter operators looking at opportunities to start schools in underserved communities; we expect applications from them in the next two application cycles. As these schools apply, it is important that we improve our authorizing practices to take into account the unique needs of start-up charters with a mission to serve diverse student populations. For example, the Achievement School District (“ASD”) has successfully launched a “neighborhood option” charter school application that has begun the hard work of getting quality charters into underserved communities. The SPCSA will be working with the ASD to expand on this approach to improving access to quality charter schools. The SPCSA will also work with its existing portfolio of schools to address ancillary costs to attending a public charter school, such as transportation and meals. Most charter schools do not provide transportation or free lunches; these are cost and logistics barriers for some families. Presently, there is no funding for public charters to provide this. However, there may be grant opportunities that may be available to begin providing for these needs. We will seek them out. In closing, the SPCSA — consisting of seven volunteer board members and sixteen staff — is proud of the progress that has been made as we have worked with our charter schools to provide high quality seats to more than 42,000 students in Nevada. However, we recognize that there is much more work to be done. Although we now have a majority-minority student population that largely aligns with the state’s demographics, we must — and will — make sure we are providing access and services to all students. Jason Guinasso is the managing partner for the Northern Nevada offices of Hutchison & Steffen in Reno and Incline Village. He is the Chair of the Nevada State Public Charter School Authority and serves as legal counsel for the Incline Village General Improvement District.